Alfred Pritchard Sloan, Jr. (/sloʊn/; May 23, 1875 – February 17, 1966) was an American business executive in the automotive industry. He was a long-time president, chairman, and CEO of General Motors Corporation. Sloan, first as a senior executive and later as the head of the organization, helped GM grow from the 1920s through the 1950s, decades when concepts such as the annual model change, brand architecture, industrial design, automotive design (styling), and planned obsolescence transformed the industry, and when the industry changed lifestyles and the built environment in America and throughout the world. Sloan’s memoir, My Years with General Motors, written in the 1950s but withheld from publishing until an updated version was finally released in 1964, exemplified Sloan’s vision of the professional manager and the carefully engineered corporate structure in which he worked. It is considered one of the seminal texts in the field of modern management education, although the state of the art in management science has grown greatly in the half century since. Sloan is remembered for being a rational, shrewd, and very successful manager, who led GM to become the largest corporation on Earth, a position it held for many years after his death. His rationality and shrewdness are also remembered by his critics as extending even to cold, plutocratic detachment or avarice. However, the magnitude of Sloan’s philanthropy suggests that he saw himself differently: as a man with greater talents and greater responsibilities than others, who was thus entitled to authority but also obligated to, and committed to, beneficence. Sloan and the management of GM in the 1930s and early 1940s – the time of the Great Depression, German re-armament, fascism, appeasement, and World War II – are part of a larger narrative about the complex nature of multinational corporations and how nationality of their members was irrelevant in some ways but relevant in others. The national governments on both sides of the Allied–Axis divide used the industrial capacity of GM – the Allies using Detroit and Vauxhall, the Axis using Adam Opel AG, GM’s German subsidiary – to churn out materiel for their war efforts. 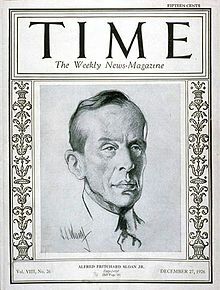 Like Henry Ford – a contemporary of Sloan’s with a rather special relationship to him as the other “head man” of an automotive colossus – Sloan is remembered today with a complex mixture of admiration for his accomplishments, appreciation for his philanthropic legacy, and unease or reproach about his attitudes during the interwar period and World War II. Born in New Haven, Connecticut, Sloan studied electrical engineering initially at Brooklyn Polytechnic Institute, then transferred to and graduated from the Massachusetts Institute of Technology in 1895. While attending MIT he joined the Delta Upsilon fraternity. Sloan became president and owner of Hyatt Roller Bearing, a company that made roller- and ball-bearings, in 1899. Oldsmobile was Hyatt’s first automotive customer, with many other companies soon following suit. In 1916 Hyatt merged with other companies into United Motors Company, which soon became part of General Motors Corporation. Sloan became Vice-President of GM, then President (1923), and finally Chairman of the Board (1937). In 1934, he established the philanthropic, nonprofit Alfred P. Sloan Foundation. GM under Sloan became famous for managing diverse operations with financial statistics such as return on investment; these measures were introduced to GM by Donaldson Brown, a protege of GM vice-president John J. Raskob. Raskob came to GM as an advisor to Pierre S. du Pont and the du Pont corporation; the latter was a principal investor in GM whose executives largely ran GM in the 1920s. Sloan is credited[by whom?] with establishing annual styling changes, from which came the concept of planned obsolescence. He also established a pricing structure in which (from lowest to highest priced) Chevrolet, Pontiac,Oldsmobile, Buick and Cadillac—referred to as the ladder of success—did not compete with each other, and buyers could be kept in the GM “family” as their buying power and preferences changed as they aged. These concepts, along with Ford’s resistance to the change in the 1920s, propelled GM to industry-sales leadership by the early 1930s, a position it retained for over 70 years. Under Sloan’s direction, GM became the largest industrial enterprise the world had ever known. In the 1930s GM, long hostile to unionization, confronted its workforce – newly organized and ready for labor rights – in an extended contest for control. Sloan was averse to violence of the sort associated with Henry Ford. He preferred spying, investing in an internal undercover apparatus to gather information and monitor labor union activity. When workers organized the massive Flint Sit-Down Strike in 1936, Sloan found that espionage had little value in the face of such open tactics. The world’s first university-based executive education program—the Sloan Fellows—started in 1931 at MIT under the sponsorship of Sloan. A Sloan Foundation grant established the MIT School of Industrial Management in 1952 with the charge of educating the “ideal manager”, and the school was renamed in Sloan’s honor as the Alfred P. Sloan School of Management, one of the world’s premier business schools. Additional grants established a Sloan Institute of Hospital Administration in 1955 at Cornell University-the first two year graduate program of its type in the US, a Sloan Fellows Program at Stanford Graduate School of Business in 1957, and at London Business School in 1965. They became degree programs in 1976, awarding the degree of Master of Science in Management. Sloan’s name also lives on in the Sloan-Kettering Institute and Cancer Center in New York. In 1951, Sloan received The Hundred Year Association of New York‘s Gold Medal Award “in recognition of outstanding contributions to the City of New York”. The Alfred P. Sloan Museum, showcasing the evolution of the automobile industry and traveling galleries, is located in Flint, Michigan. Sloan maintained an office in 30 Rockefeller Plaza in Rockefeller Center, now known as the GE Building. He retired as GM chairman on April 2, 1956. His memoir and management treatise, My Years with General Motors, was more or less finished around this time; but GM’s legal staff, who feared that it would be used to support an antitrust case against GM, held up its publication for nearly a decade. It was finally published in 1964. Sloan died in 1966. Sloan was inducted into the Junior Achievement U.S. Business Hall of Fame in 1975. The Alfred P. Sloan Foundation is a philanthropic non-profit organization established by Sloan in 1934. The Foundation’s programs and interests fall into the areas of science and technology, standard of living, economic performance, and education and careers in science and technology. The total assets of the Sloan Foundation have a market value of about $1.8 billion. The Sloan Foundation bankrolled the 1956 Warner Bros. cartoon Yankee Dood It, which promotes mass production. In the late 1940s, the Sloan Foundation made a grant to Harding College (now Harding University) in Searcy, Ark. The foundation wanted to fund the production of a series of short films that would extol the virtues of capitalism and the American way of life. According to Edwin Black, Sloan was one of the central, behind-the-scenes founders of the American Liberty League, a political organization whose goal it was to defend the Constitution. In turn, the League would finance other groups with openly more extreme agendas. One such group was the Sentinels of the Republic to which Sloan himself made a $1000 check. After a Congressional investigation into this group went public in 1936, Sloan issued a statement pledging not to further support the Sentinels. Also according to Black, the GM chief continued to personally fund and organize fund-raising for the National Association of Manufacturers, which was critical of the New Deal. The Sloan Foundation has made two grants, of USD 3 million each, to the Wikimedia Foundation (WMF). These are some of the largest grants that the WMF has received. This profile is partly adapted from a Wikipedia entry on Alfred Sloan, available under the Creative Commons Attribution-ShareAlike License.